Education is expensive. If we can reduce textbook costs, students may be able to take more classes, complete their programs more quickly, and be more successful. Once faculty have participated in an introductory webinar, they may review an open textbook that is located in the Open Textbook Library (open.umn.edu). Working with the Open Textbook Network and Library, faculty will receive a $200.00 honorarium once the review is completed. the Canadians are using (citing) Acker (Ohio) in their research. stats are colored in green for convenience. Stats regarding the increase in textbook costs are re-printed from author to author: e.g. Acker (2011, p. 42). Murey and Perez (2011, p. 49 (bottom) – 50 (up)) reports stats from 2009 and projections for 2013 regarding etexbook adotion. Same authors, p. 50 second paragraph reports good stats regarding texbooks’ price increase : US$1122 per year for textbooks in 2010. Wimmer at al (2014) presents a lucid graphic of the structure of the publishing process (see bottom of this blog entry for citation and perm link). regarding in-house creation of e-textbooks, see (Distance education, e-learning, education and training, 2015). It very much follow the example of SUNY, which Keith was laying out: a team of faculty charged with creation the e-textbook for mass consumption. Besides the SUNY model Keith is envisioning for MnSCU (comparable), there is the option of clustering OER sources: e.g. NASTA as per Horejsi (2013), CourseSmart. FlatWorld Knowledge (Murrey and Perez, 2011) etc. Hamedi & Ezaleila (2015) present an entire etextbook program. Article has been ordered through ILL. Same with Joseph (2015). Open Educational Resources in Acker (2015, p. 44-47). Also in Murey and Perez (2011, p. 51). Jeff Gallant, Jeff.Gallant@usg.edu: David Ernst with the U and Ashley Miller from Ohio State U: dernst@umn.edu. Ashley’s is miller.6275@osu.edu. a dedicated device for reading electronic versions of printed books. my note: there is no good definition about e-textbook in terms of the complexity, which e-textbook on campus might involve. e-textbook is a compilation of textual, multimedia and interactive material, which can be viewed on various electronic devices. E-textbook can: 1. be purchased from a publisher; 2. compiled in HTML format on faculty or group web space; 3. compiled on the content module of LMS (BB, D2L, Canvas, Moodle, etc.) 4. compiled on LMS (BB, D2L, Canvas, Moodle, etc.) and including all interactive materials: e.g. hyperlinks to MediaSpace multimedia, quizzes, etc. ; 5. compiled on special apps, such as iBook Author, eCub, Sigil. (Electronic-BOOK) The electronic counterpart of a printed book, which can be viewed on a desktop computer, laptop, smartphone, tablet or e-book reader (e-reader). When traveling, a huge number of e-books can be stored in portable units, dramatically eliminating weight and volume compared to paper. Electronic bookmarks make referencing easier, and e-book readers may allow the user to annotate pages. Although fiction and non-fiction books come in e-book formats, technical material is especially suited for e-book delivery because it can be searched. In addition, programming code examples can be copied, which is why CD-ROMs that contained examples or the entire text were often packaged inside technical paper books. There are several e-book formats on the market, including EPUB, Mobipocket (PRC, MOBI), eReader (PDB), Kindle (AZW, KF8) and Apple iBook (EPUB variation). Many e-readers also accept generic formats, including Adobe PDF and plain text (TXT). Electronic Textbooks or Paper Textbooks: What Are Students Reading? According to a United States Government report, textbook prices have increased at over twice the rate of inflation in the last couple of decades. According to another report, the average student spends between $700 and $1,000 per year on textbooks while the cost of e-textbooks can be as much as 50% lower than paper textbooks. Oxford dictionary, an electronic book or e-book is “an electronic version of a printed book that can be read on a computer or handheld device designed specifically for this purpose.” An e-textbook is defined as an e-book used for instructional or educational purposes and often includes features such as bookmarking, searching, highlighting, and note-taking as well as built-in dictionaries and pronunciation guides, embedded video-clips, embedded hyperlinks, and animated graphics. E-textbooks have moved from occasional usage to a mainstream technology on college campuses. According to the Association of American Publishers, sales of e-books hit over $90 million; this is up over 200% when compared to the same month the previous year. When the cost of textbooks and the availability of formats are considered, the use of an e-textbook in the classroom may be the reasonable choice. A digital textbook is a digital book or e-book intended to serve as the text for a class. Digital textbooks may also be known as e-textbooks or e-texts. Digital textbooks are a major component of technology-based education reform. They may serve as the texts for a traditional face-to-face class, an online course or degree. According to the United States Government Accountability Office, prices have increased 82 percent from 2002 to 2012.3 This cost sometimes drives students to delay or avoid purchasing textbooks. Digital materials such as e-textbooks may offer a more cost-effective alternative.4 Also, the expectation for digital materials is gaining strength in the K–12 sector.5 For example, Florida school districts set a goal to spend at least half of classroom material funding on digital materials by the 2015–2016 school year. Given that 81 percent of first-time-in-college (FTIC) undergraduate students hailed from a Florida public high school during the fall 2014 semester at the University of Central Florida (UCF), it is important to anticipate student expectations of digital materials. Finally, the availability of digital materials has risen exponentially with the incredible popularity of mobile devices. a survey questionnaire in 2012 that explored basic usage and attitudes regarding e-textbooks. This qualitative study gives insight into the experiences instructors have when working with publishers to integrate electronic content and technology into their courses. Baek, E., & Monaghan, J. (2013). 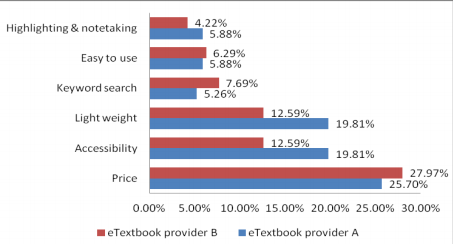 Journey to Textbook Affordability: An Investigation of Students’ Use of eTextbooks at Multiple Campuses. 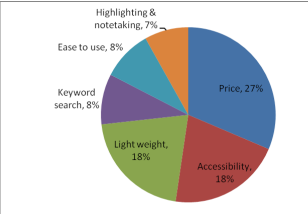 International Review Of Research In Open And Distance Learning, 14(3), 1-26.
the Advisory Committee on Student Financial Assistance (2007) reported that textbook prices represent a significant barrier to students’ accessibility to textbooks. The report concluded that textbooks cost between $700-$1000 per year; textbook prices have risen much faster than other commodities; and that college aid fails to cover textbook expenses. Textbook costs are equivalent to 26% of tuition costs for an average four-year public university student and 72% of tuition costs for an average community college student. In fact, the California State Auditor (2008) reported that textbook costs grew more rapidly than student fees in academic year 2007–08. Wimmer, E. e., Morrow, A. a., & Weber, A. a. (2014). 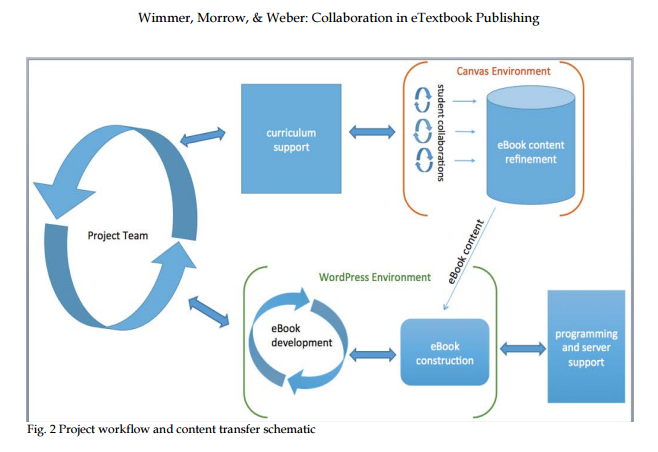 Collaboration in eTextbook Publishing: A Case Study.Collaborative Librarianship, 6(2), 82-86.
onto Youtube so that the user could access these via the internet. review questions with instant feedback and assessment. the author reflects the process on a state level (Ohio). Marcoux, E. “. (2012). Best of the Best Planning. Teacher Librarian, 39(4), 69-70. Much of the research related to digital texts has focused ontechnical aspects of readability (see Dillon, 1992, for a review) and limitations of digital media for note-taking, underlining, or highlighting text (Brown, 2001). However, the important—and unanswered—question from a teaching perspective is, ‘‘Can students learn as well from digital texts as from paperbound textbooks?’’ Few published studies have addressed this ques-tion directly, and even fewer studies have examined this ques-tion among college students. Murray, M. C., & Pérez, J. (2011). E-Textbooks Are Coming: Are We Ready?. Issues In Informing Science & Information Technology, 849-60.
read the entire article, good data. Španović, S. (2010). PEDAGOGICAL ASPECTS OF E-TEXTBOOKS. Odgojne znanosti. 12(2). 459-470. ICWL (Conference) (13th : 2014 : Tallinn, E., & Cao, Y. (2014). New horizons in web based learning: ICWL 2014 international workshops, SPeL, PRASAE, IWMPL, OBIE, and KMEL, FET, Tallinn, Estonia, August 14-17, 2014, revised selected papers. Cham: Springer. NEW SoftChalk Create 10 and SoftChalk Cloud eBook publishing features will arrive on April 25th! Come check out the latest enhancements at our upcoming webinars! Sleek Designer Headers and Callout Boxes – Add some new pizazz to your SoftChalk lessons! Three New Quiz Types – Test your students’ understanding with Sentence Completion, Multiple Blanks and Feedback Questions. Polished New QuizPopper and Activity displays – With an enhanced interface for instructors and students. Accessibility enhancements – Make your lessons available to everyone with even more accessibility enhancements. are any faculty really going digital? Which content distributors will thrive? What are the implementation concerns? And when will going digital really happen?